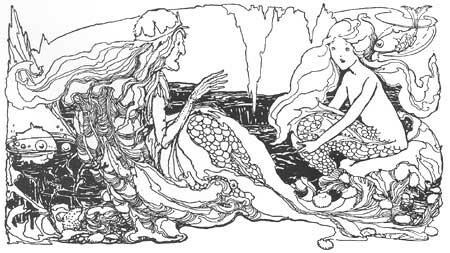 Reading Andersen’s “The Little Mermaid” after seeing the Disney movie can make it feel like the Christian references were awkwardly tacked on to a story that really has nothing to do with Christianity. But if we read it from a Christian perspective, it’s astonishingly beautifully crafted. Andersen uses transitions from darkness to light and from depth to height to depict a Christian journey into ultimate reality. 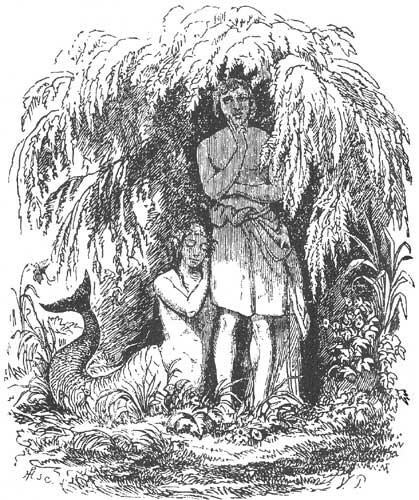 In Andersen’s version of the story, the titular little mermaid has always been enthralled by the world above and by the prince. But it’s only when she learns that human beings have immortal souls that she visits the sea witch in order to become human. Her goal in marrying the prince is not only love but also the acquisition of an immortal soul, which — according to legend — could be granted to a soulless being through the sharing of two souls in holy matrimony as performed by a priest. This, of course, puts the mermaid in a terrible situation, because in order to strive for heaven she must also strive for the intermediate earthly goal of marrying a human being. This is the central conflict of the story. The grandmother tells the mermaid about the world above. The story progresses through these three strata, beginning with the mermaid trapped in the depths of the ocean, proceeding to her visiting land and eventually living there, and concluding with her existence as a Daughter of the Air. But the story is made complicated by the mermaid’s need to travel through the stratum of land in order to reach the stratum of heaven. The deepest stratum, the ocean, is introduced to us right away in terms of its depth. Andersen describes it in the first sentence as “very, very deep; so deep, indeed, that no cable could fathom it: many church steeples, piled one upon another, would not reach from the ground beneath to the surface of the water above.” Lest we forget its depth, we are then told that the palace is at the very deepest spot of all and that the mermaid’s eyes are as blue as the deepest sea. The word “deep” is repeated throughout the story, particularly in connection with the death of sailors through the temptation of mermaid song and with the dark, fathomless nature of the sea. The sea is thus not only literally deep but also a low spiritual point. Here the mermaid has no chance at eternal life, and she only sees, so to speak, through a mirror dimly. She yearns to know what lies above the waters, but she is at first not even permitted above water. She can only see the stars “faintly,” as well as a “black cloud” that could be either a ship or a whale. When her eldest sister goes above, she looks up through the “dark blue water” and imagines that she could hear church bells, even “down in the depths of the sea.” The dark depths of the sea thus prevent her from accessing a symbol of the spiritual realm, and symbolically prevent her from accessing spiritual salvation itself. The first indication that the mermaid yearns for more than her dark, deep underwater existence is in her love of the sun. She plants a garden of red flowers in the shape of the sun, and we are told that she “cared for nothing but her pretty red flowers, like the sun” — except, that is, for the marble statue of a human being which stands in her garden. Here everything is distorted, as one might expect in an underwater world. The flowers are like “flames of fire,” the fruit like “gold,” the earth like “the flame of burning sulphur” — all images of light or flame. By contrast with this, the sun is made bluer through the waves, until it looks like “a purple flower.” The flowers look like flames, and the sun looks like a flower! As in Plato’s cave, the shadow reality of the world underneath looks more real than the world above. But the mermaid, like Plato’s hero, yearns for the sun. This is made complicated by the intermediate stratum of the land, which is represented in her garden by the marble statue of a human being. A marble statue is a curious choice for Andersen here, because marble statues are essential parts of Christian religious iconography. It is common to see marble statues of Jesus or Mary in churches. The mermaid’s relationship to this statue — the way she displays it prominently in her garden as a symbol of her deepest yearning and cares for almost nothing else — is indeed almost like worship. But the statue is, in the end, just a rock in the shape of an ordinary person. Immediately after being introduced to the statue, we are told about its “shadow” and how it “seemed as if” it was kissing the tree. Tracking the images of light and clarity of perception here, it seems we are back in Plato’s cave. We are told explicitly that the sun has just set before the mermaid comes to the surface. She has not, as yet, experienced the true brilliance of the sun. But she does see light in a way that she had never experienced beneath the ocean. Most of her sisters have retreated into the ocean out of fear of the world above. The little mermaid, too, is afraid when she sees the fireworks as “bright as day,” and she dives back into the water. But then, unlike her fearful sisters, she faces the light and comes back to the surface. In this moment she feels “as if all the stars of heaven were falling around her,” a foreshadowing of the spiritual importance of her choice to return to the light above her. The prince is an important part of her spiritual journey. As she saves him from sinking into the depths of the sea, he is an opportunity for her to practice virtue and to experience love. Yet he is, ultimately, just a human being — and one she comes dangerously close to worshiping. She wraps her arms around the statue that reminds her of him, but stops tending the flowers that represented the sun, until her garden becomes “dark and gloomy.” Thus the human who stands in between her realm and the realm of heaven distracts her from the light of heaven. And ultimately, he cannot give her the salvation she ultimately desires. He is merely a human prince, not the Prince in heaven, despite the marble statue of him. And the narrative itself depicts him as almost Christlike in how he is described as “coming to life again” when she saves him. She “suffered unheard-of daily pain for him,” as if she were an ascetic suffering for Christ. The mermaid has confused the human world — her waystation toward heaven — with heaven itself. Dazzled by humans’ seeming ability to travel “far above the clouds” and by the prince “on whom her wishes depend,” she cannot see this human for what he is: a mere human. And so the mermaid sacrifices everything for the hope that this one human being may love her. Her visit with the devilish sea witch is frightening and Faustian in tone, yet the content is opposite: she is sacrificing temporary pleasure in order to gain an immortal soul. The fact that she deals with a witch in hopes of entering heaven reflects her difficult predicament whereby she must pass through the earthly world in order to gain entrance to heaven. Once on land and with the prince, we enter Plato’s cave again. We are told that “the sun had not risen” when she first comes ashore. She cannot speak or communicate. The prince marries another woman because of a case of mistaken identity. Nothing is clear now. Finally, the sun returns to the story. At sunrise, the mermaid will die, unless she kills the prince during the night. She sacrifices herself for his life, and by so doing, in a scene brilliantly illuminated by the morning sun, she is finally able to begin ascending to the stratum of heaven, not through a man’s soul but through treating a human being with love and with virtue. But the ending is ambivalent. She does not go to heaven straight away, but rather becomes a “daughter of the air” who earns a soul by her good deeds toward human beings. Her time may be lengthened and shortened by the actions of human beings. It seems that, for Andersen, there is no path to heaven except through this plane of mundane reality. Human beings are no substitute for the divine, but love and connection to other human beings is the way we come to salvation and to ultimate reality. The mermaid’s tale, then, is ultimate our tale as well. Like her, we must pass through the mundane reality of this world, in all its imperfection, to have a hope of reaching the Kingdom of Heaven. The quotes in this piece were taken from the 1872 translation by H.P. Paull. I am an aspiring math teacher and an amateur writer and musician. I love classical Jewish texts, mathematics, logic, linguistics, languages, and literature.